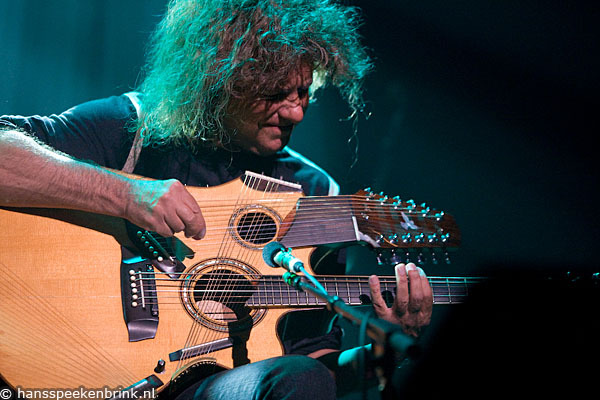 Here are guitars and then there are guitars; if you thought Pat Metheny’s 42-stringed Picasso was unusual, then you would be amazed by the invention of Sardinian guitarist Paolo Angeli, as were all who witnessed his captivating performance in the Town Hall on Saturday afternoon. If Metheny’s custom-built guitar is a Picasso, then Angeli’s creation is most definitely a Dali. To a conventional acoustic guitar Angeli has added the machine head of a cello from which strings run parallel above the guitar’s own. Eight more strings run across the mouth of the body perpendicular to the conventional strings. Two motors inside the body of the guitar can be activated to rotate tiny strings, which rotate furiously against the main strings producing a high-pitched trilling noise like a harp on 78 rpm. Two blocks of wood hold a series of foot pedals which activate a row of hammers on the base of the body to strike the base of the strings. A couple of large springs protrude surreally from the body like antlers and are used percussively. The instrument also has fourteen direct outputs, and the spaghetti of wires running to his tuner and effects box (added to the high-backed Tudor chair) gave the whole apparatus the look of an electric chair for guitarists. had a significant effect on the Angeli after a collaboration between Frith and the Eva Kant ensemble in which Angeli played and which realized the Frith albumPacifica. (Tzadik, 1998). Frith’s application of found objects to alter the sound of his strings has been adapted by Angeli, and he employed miniature clothes pegs, train tickets, batteries and plastic strips to this end. A sink drainer-plug placed under the strings brought an oud-like quality to the playing and at the beginning and end of the concert he used a plastic bag under his bare foot as a gentle percussion instrument. Angeli used a bow to maximum effect, not only on the strings, but on the springs too. A flick of a switch would amplify his instrument and depending on the direction the music was taking he would play electric guitar or electric cello, layering sounds, searching for sounds. The hour-long improvisation which started from compositions by Frith and Bjork had the elegance of chamber music in certain passages and the intensity of King Crimson in others, and there was a touch of Sardinian folk added to the mix. 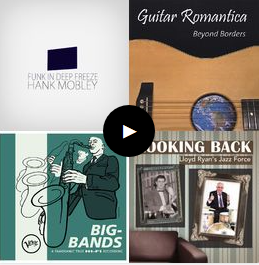 It is no easy task to do Angeli’s music justice in describing it, but as guitarists go, he is definitely an original of the species; better perhaps to let the guitarist’s own words describe his approach to improvisation: “When I start to play I really don’t know what I play; it is a kind of a travel for me. It is like navigation between two islands. When there is something to explore I stop there and think this is nice. I like, and I try to fish something.” Angeli encored with a haunting, bow-led take on Bjork’s “Unravel,” plastic bag and all, and arrived once again to an island of silence which marked the end of his travel and that of the audience who had travelled with him, rapt all the while.